Fill your morning with sticky peaches, enveloped in a sweet “cream cheese” sauce. Preheat the oven to 425F. Generously oil two 1 cup ramekins with coconut oil and set aside. 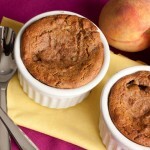 In a medium sized bowl, combine sliced peaches coconut sugar, cinnamon, vanilla, and arrowroot. Mix gently and divide into prepared ramekins. Bake for 10 minutes. Remove from oven and reset to 375F. Meanwhile combine all pancake mix ingredients in your blender and blend on high until smooth. 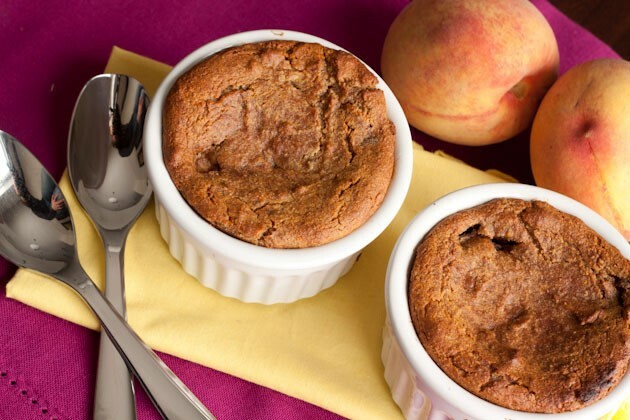 Pour batter over top of each ramekin and return to the oven for 35 minutes or until topping begins to crack.